Hang Zhou, 25 July 2009 – For Swiss watchmaker Hublot , there are today so many reasons to organise an event in China: the opening of their shop in Hang Zhou, the launch of the second edit ion of the Red Devil Bang, together with the Manchester United team and, last but not least, the opportunity to make a gesture in support of the HOPE Foundation, through a one million $ challenge. Hublot is continuing its activity in the Chinese market with an event which turned out to be both spectacular and generous. The watchmaking brand has invited several of the best Red Devils players to take up a challenge that would test even the most finely-honed shooting skills. This has taken place on the same day as the opening ceremony of their first shop in Hang Zhou at the prestigious department store “Hang Zhou Tower”. The aim was for Paul Scholes, Ji-Sung Park, Rio Ferdinand and Patrice Evra to shoot the ball from the shore of the “West Lake” into a target placed 16 metres away, on a boat. 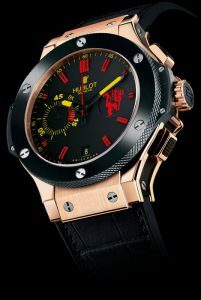 For each goal scored, Hublot promised to donate the sum of $250,000 to the HOPE Foundation, a notfor-profit organisation who raises funds to help children in China and Hong Kong, by setting up education programs (www.hope-ef.org). Jean-Claude Biver, Sir Alex Ferguson and David Gill, CEO of Manchester United, were there to cheer on the four players! In a festive spirit, the enthusiastic players finally couldn’t make it, even though Rio Ferdinand hit the target board very close to the hole. Sir Alex Ferguson couldn’t resist to make an attempt himself – wearing his “every day” shoes ! -, and his legendary talent didn’t lie as he was the one who kicked the closest to the goal ! David Gill also tried, and then Jean-Claude Biver, after a attempt on the grass, boarded on a boat to bring symbolically the ball in the hole and to offer the Foundation $10’000, in addition to the 100’000 promised. The cheque was donated to the famous founders and representatives of Hope Foundation, the actress Miss Lee Xing Jie and the singer Miss Xu Ru Yun. After a committed season of cooperation and partnership, Hublot and the Red Devils used this event to present a new edition of the Big Bang in the colours of the reigning English champions. With a 45 minute counter at 9 o’clock, the “Red Devil” logo at 3 o’clock, and a new rose gold case fitted on a rubber Alligator strap, the series is limited to just 99 pieces! This new model will delight fans of both Manchester United and Big Bang with its sporty yet sophisticated appeal.